We hear it every day. People complaining about a lack of storage and advertisers telling us that we need more. Why? Because we tend to pack things away and keep them, even when there’s no longer reason to. That’s one of the big, exciting challenges I set out for my husband and I when we moved to Los Angeles earlier this year. I didn’t want to just get storage containers and fill them up again after all the work we did getting rid of things. But this weekend, I caved. We went to IKEA (which is a wonderful and yet dangerous place when it comes to impulse buying). We purchased plastic tubs, a dresser, shoe rack, baskets…we also bought a giant plant and a wok for some reason, but they’ve been on our “wish list” for a while so it wasn’t too bad. But we have a huge closet and a built in dresser – why did we need storage? I’ll tell you – from firsthand experience – nothing is always as it seems. And by that, I mean there are cockroaches in Los Angeles. We really haven’t had too much of a cockroach problem, but here’s a little story that will make your skin crawl (and might make you might think I’m gross). A couple months ago, I noticed something that looked like cockroach poop in one of my clothes drawers. I decided to blindly move forward, not accepting the notion that a cockroach could be living among my clothes. A month later, I finally faced my fear and went through the drawer. Sure enough, there was a spooky little guy scampering around in my unmentionables like it was just another typical day. TV Stand – to support the long-awaited TV. My husband has been really patient for almost 6 months without a TV, so we took the plunge this weekend. Plastic bins – the rabbit hay and food is also susceptible to cockroaches, and I really don’t want to serve them bugs for breakfast. Rory had the fortune of meeting a cockroach and he threw his hay box at it. He does not like. A “paper-hider” – being a grown person means having a weirdly large amount of paperwork. We got a small bin to organize/hide it all. It’s about time to go through them again and get rid of what we no longer need. 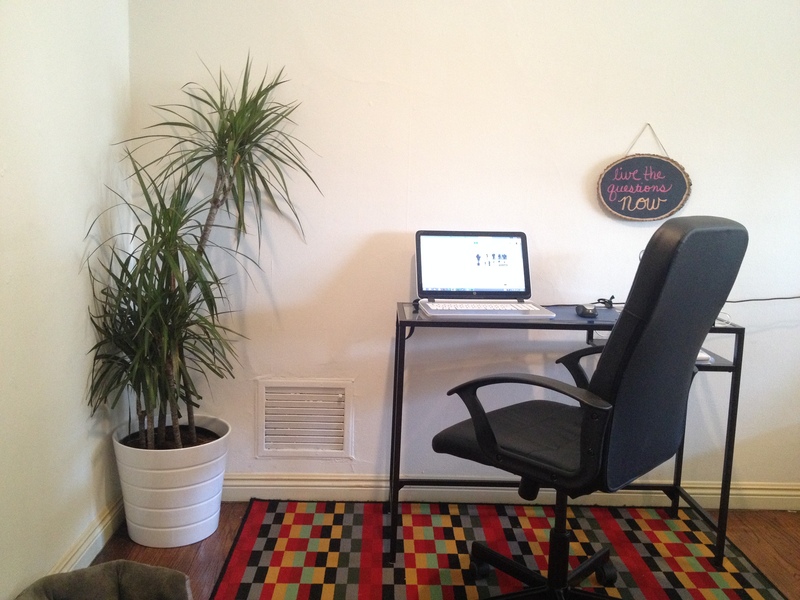 Our new Dracaena Marginata next to my desk. I also switched rugs and furniture around this weekend, as I am prone to do. These past couple of months I’ve started to realize that simplifying and organizing are not as mutually exclusive as I thought. I wrongly considered organizing a weak substitute for actually making a change and simplifying. But when you live simply, you still have ugly things like guitar cords and rabbit food that need proper places in your home. Don’t be afraid to get storage to solve pain points, but don’t use storage as a band-aid to avoid necessary simplification. I think I’m starting to see the benefits of strategic storage. How about you – is storage your friend or your enemy?